Events have been eventuating with great speed since my last poorly worded post and update from the Antipodes. Here in New Zealand our shambolic exercise in not picking a new flag is becoming a) political and b) something that people will quickly stop paying attention to when the Rugby World Cup starts. Meanwhile across the ditch, my useful column last week explaining how awful oxygen thief Tony Abbott could distract Australia from his flailing incompetence has sadly for him arrived too late and he has been disposed in what Australians mysteriously refer to as a spill. Malcom Turnbull, his replacement as Lord and Master of God’s Own Country, is probably an improvement as he is, to pick two issues at random, not particularly hostile towards gays and doesn’t deny the reality of climate change. Being in charge of a reactionary party in the thrall of big coal means he probably won’t be able to effect any changes to actually policy, but at least he’ll probably feel bad about it. Progress, of a sort. At any rate goodbye Tony Abbott you awful terrible ghastly reprehensible and useless excuse for a human being. My column last week suggesting birds that could serve as Australia’s official bird also generated some comments (via facebook) suggesting alternatives. This is a double edged sword for me. On the one hand, like all writers I crave comments, as they validate my decision to write something by indicating that someone read it. On the other hand, suggesting something I hadn’t thought of suggests I didn’t do due diligence and instead bashed out a post as quickly as possible at the last possible moment while drinking too much wine. Worst still, the suggestion of Laughing Kookaburra is pretty much the worst suggestion that could have been made because a) yes it absolutely should be Australia’s national bird and b) I actually did think of including it but then forgot. It’s hard to escape the kookaburra when in Australia. They are large, scruffy looking kingfisher by ancestry, five species of that family founds across Australia and New Guinea. 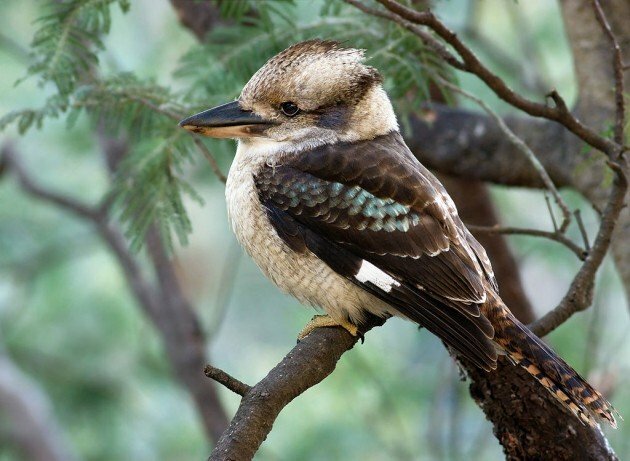 But the Laughing Kookaburra is unlike any kingfisher familiar to Europeans or Americans. It is entirely free of the watery existence of those kingfishers. It lacks attractive plumage, although hints of a prettier ancestry remain in the blue flecks across its rear and wings (indeed some of the other kookaburras have rather prettier coats). But the Laughing Kookaburra hasn’t won its fans though looks, it is one of Australia’s favorite birds through force of personality. Partly it’s the laugh. If you never have, have a listen. The only bird that comes close to evoking the sound of the Australian bush is the odd warbling Australian Magpie. Early European settlers called it the Settler’s Clock, because the raucous calls saw the day in and ended it. Laughing Kookaburras are social, so you can end up with an entire family of the things above your bedroom laughing away at all hours. As my mum points out all the time. At any rate they demand attention, and receive it in spades. They also managed to wriggle their way into the affections of Australians by being predatory. Specifically they’ll have a go at the kind of dangerous snakes that make Australia such an interesting country to live in. Their boldness as hunters suggests it’s perhaps a mercy they are on;y as big as pigeons as any bigger and they may have been tempted to go after us. As it is they are big enough to be considered useful without being a threat, which is pretty much as good as it gets for most people. So let’s hear it for the Laughing Kookaburra, the best national bird Australia won’t have. Long may you keep people up at all hours with your laughter! Laughing Kookaburra by JJ Harrison (CC). I had to use some Wiki-images cause I wrote this and then found I had barely any good images of this species. By which I mean none. There was a serious proposal put forth in the mid-nineteenth century to introduce this bird to Martinique. Can you imagine? They actually were introduced to New Zealand but didn’t thrive or spread. I guess there aren’t enough dangerous snakes for them here. Having visited Australia twice, my vote is definitely for the Laughing Kookaburra! And for second place, the Gorgeous Galah. 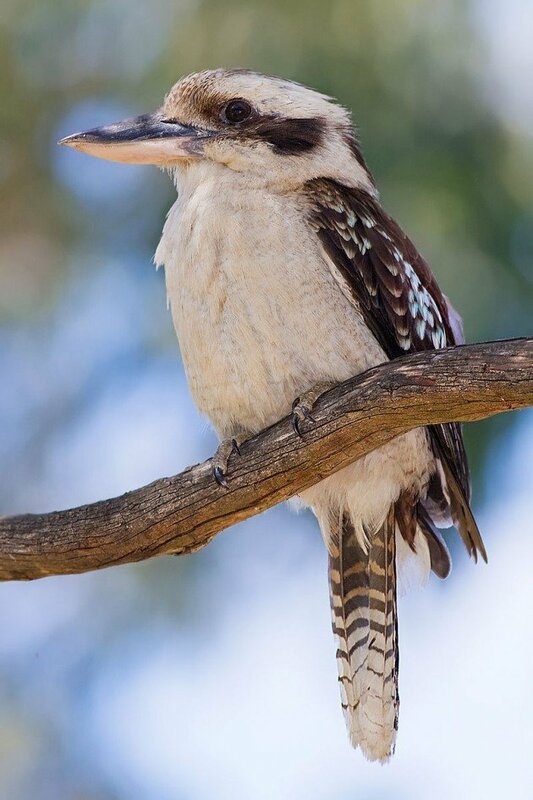 I don’t see the Kookaburra song mentioned as a reason for (or against) making the Laughing Kookaburra the national bird. Maybe it’s a reason against, since the song is the worst kind of ear worm. Where Are You Birding this Third Weekend of March 2009?